Bulgaria needs sweeping reforms that would ensure the "long-deserved" better living standards for its citizens, former EU Commissioner Meglena Kuneva announced Monday during the presentation of her official presidential candidacy. Kuneva was introduced to the Bulgarian political scene by the National Movement for Stability and Prosperity (NMSP), a member of the three-way government (2005-2009), set up by former Bulgarian Tsar and former Prime Minister Simeon Saxe-Coburg. In August 2001, she was appointed Deputy Foreign Minister and Chief Negotiator for Bulgaria's EU accession. On May 29, she was elected Minister of European Affairs, which was followed by her term in office as an EU Commissioner in charge of consumer protection. In her formal public address, Kuneva drew special attention to the fact that she is an independent candidate who will neither rely on support from political parties, nor undertake political commitments or represent lobbies. She said that, upon starting her pre-election tour 6 months ago, she had aimed to assess the impact of the five years of EU membership for Bulgaria. What she had seen, however, was discouraged people who were unhappy with the quality of their lives, whose attempts to do business were smothered by red tape, and who were constantly fighting emigration thoughts. Kuneva explained that Bulgaria was plagued by striking deficits of will to reform, of self-confidence, of freedom, transparency and justice. "Our children are running away to chase their dreams, while we are running away to quench our anger. We are on the wrong track. It is essential to change course- Bulgaria has been drifting away from Europe because the spirit has gone back to the past ", the former EU Commissioner declared. The ideal head of state, in her opinion, is a leader and a national unifier who guides the people instead of piling orders on top of orders. As major opponents in the presidential race Kuneva cited "stifled reforms, insufficient support for education and culture, the lack of hopes". 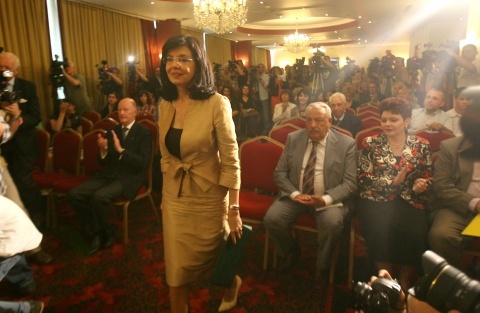 She vowed to consult the ideas and opinions of the Bulgarian people to finish the list of national priorities. In her address as a presidential hopeful, she assigned highest priority to reforms in the spheres of education, culture and medicine, highlighting than no economy can exist without these foundations. "Bulgaria must be once again proud of its bright people, it must take the lead in the sphere of information technologies and feel part of the elite on a global scale", Kuneva insisted. Regarding medical reform, she pledged to fight for patients' rights, pointing out that "health care is not pure business or a host of clinical pathways". Bulgaria's former EU Commissioner further explained that she believes in achieving results through persistence and authority, not through power. She vowed to be a president who fights for a free economy unencumbered by monopolies. "I know that the president does not steer the economy, but they could attract investors through a smart approach or chase them away with their provincialism". Kuneva pledged to initiate public discussions, to protect Bulgaria's national currency and to veto laws which increase tax rates or favor monopoly power. She said her platform was ready, adding that discussions would start within 10 days. "The presidential institution must embody the unity of citizens and give them a stronger say", Kuneva stated, underscoring that she would count on the support of a wide range of social groups and NGOs to help her update the agenda year after year. "I would prefer to rely on small donations from a wide majority of people", Kuneva remarked, stressing her desire to remain totally independent while remaining accountable to the citizens "because I owe them that". In her words, the introduction of the majority vote was what made her return to Bulgaria and run for president. "The majority vote best represents the commitment which politicians undertake before the citizens", she added. Kuneva informed that the Vice President nomination was not yet clear and that the top priority for the initiative committee was the action plan for Bulgaria for the next five years. She emphasized that the next president would have to prepare the country for the rotating EU presidency, meaning that the person occupying the position must be well acquainted with EU's policies and be able to represent Bulgaria in a dignified manner. The ex EU Commissioner was firm she would not call for investing the president with greater powers but would seek to give the existing functions a meaning. She dismissed the idea that she would seek the support of political parties at a potential run-off, stressing that, in order to ensure a strong presidential institution, Bulgaria needs an independent head of state.